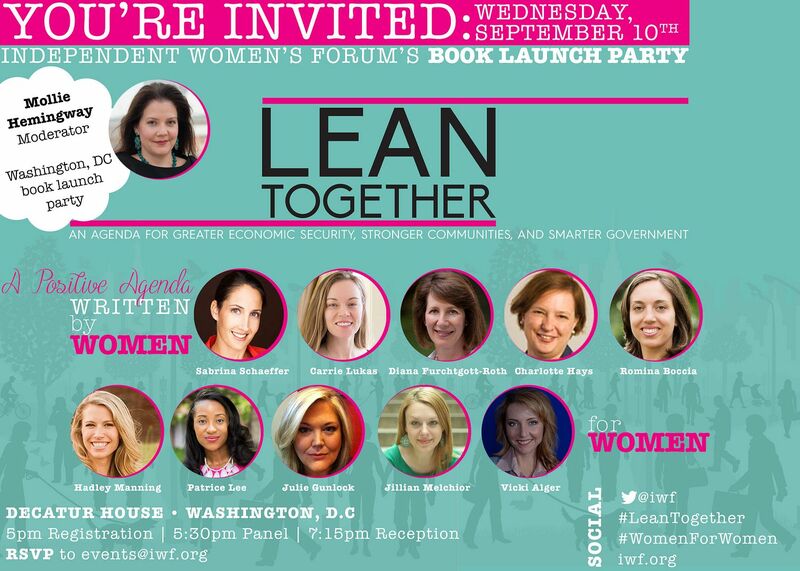 (WASHINGTON, DC) -- This Wednesday, September 10th, the Independent Women's Forum (IWF) introduces its new book LEAN TOGETHER: An Agenda For Smarter Government, Stronger Communities, And More Opportunity For Women (IWF Press; September 1, 2014; Paperback $10.00) at the Washington, DC book release party and discussion held at The Decatur House (1610 H Street, NW Washington, DC 20006) at 5:30pm ET. 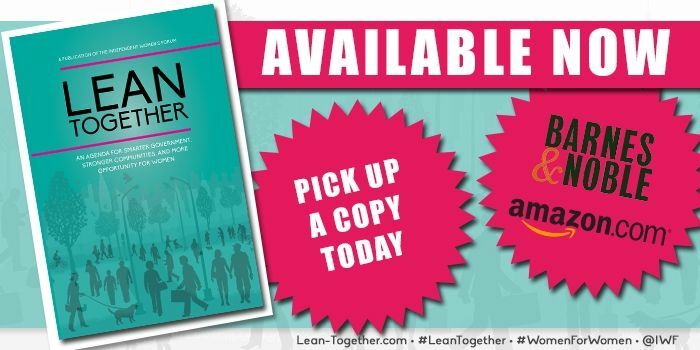 LEAN TOGETHER is 12 chapters, all written by female authors. It presents a better vision for America: smaller government, stronger communities, a vibrant economy, and more opportunity for women and men alike. 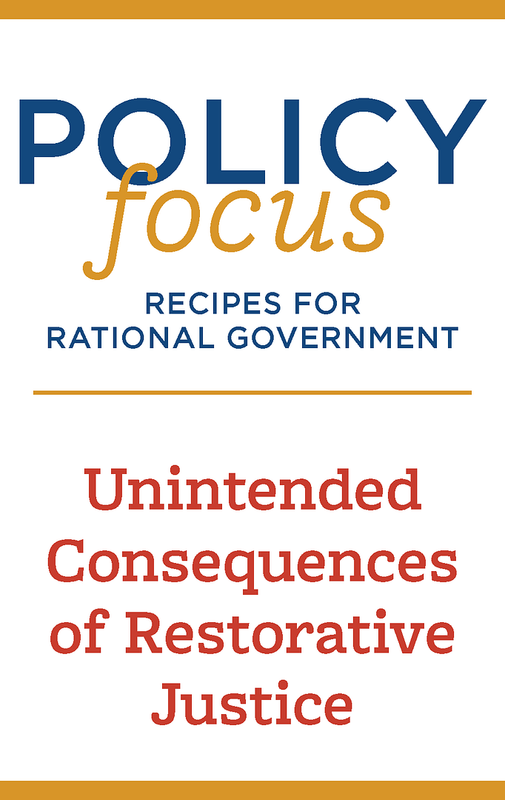 It presents a vision of America in which republican ideals of limited government, virtue, and self-improvement are re-imagined and it offers concrete policy prescriptions that will rein in the progressive state, streamline government, and strengthen our economy. The panel includes LEAN TOGETHER contributing authors. Moderator is The Federalist's senior editor Mollie Hemingway. Mollie Hemingway • Senior editor at The Federalist. A longtime journalist, her work has appeared in the Wall Street Journal, USA Today, the Los Angeles Times, the Guardian, the Washington Post, CNN, National Review, GetReligion, Ricochet, Christianity Today, Federal Times, Radio & Records and many other publications. Diana Furchtgott-Roth • Former chief economist of the U.S. Department of Labor, is a senior fellow and director of Economics21 at the Manhattan Institute for Policy Research. She served as chief of staff of President George W. Bush’s Council of Economic Advisers. She is the author of Women’s Figures: An Illustrated Guide to the Economic Progress of Women in America and a columnist for MarketWatch. com.